The wardrobe boxes are a highly effective moving box that was designed especially to safely transport clothes during the whole moving process. 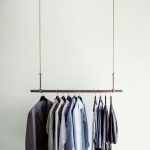 When you have a wardrobe box packed and ready, all you have to do is move your clothes from their hanging position in the closet and have them hung on the metal hanging bar of the box. The boxes can be packed pretty quickly (due to the fact that your clothes can be left on the hanging bar) and you can also rest assured that your clothes will remain clean and straight while you move. Also, wardrobe boxes reduce the amount of stress you’ll face when you finally get to your home as all you have to do is to open them up and hang your clothes in your new home’s wardrobe. You can easily place small items like pillows, pillow cases, bed sheets, blankets, etc. on the floor of the wardrobe box (if you have enough space, that is). However, it is essential that you don’t put too many clothes on the floor so as not to have the clothes inside wrinkled. Apart from hanging clothes, you can also make use of wardrobe boxes to pack any large and irregularly shaped items that might be in need of a carton. Examples of such items include wrapping paper rolls, garage tools (like rakes, shovels, etc. ), and artificial plants. Due to the size of the wardrobe moving boxes, you might find the carton a tad pricey. However, if you’re looking to save yourself some money, then you can remove your closet hanging clothes from the hanger, fold them and move them into smaller boxes. Wardrobe boxes are incredibly useful tools that will help get your entire wardrobe easily moved, and they definitely have the ability to make any moving process easier and more comfortable. However, it is also important that you remember not to compromise on quality. The wardrobe boxes with the highest quality are the most effective, and you need to ensure that even if it will cost you more, you get one of those.